What use is the best jammer if it can´t be used where it is actually needed. When blocking remote controlled explosive devices, an uninterrupted suppression of the remote control signals must be ensured. With this briefcase solution, flexible use is possible without problems. Integrated batteries, connection to the supply system of the car or truck as well as the possibility to operate the jammer on the mains allow a wide variety of applications. Especially in the field of personal security, these jammers can thus always be used in the vicinity of the person to be protected. Whether vehicle, hotel, restaurant, etc. This briefcase solution makes fast protection feasible. The jammer´s special operating mode using optimised target frequency interference is very effective. This technology allows for a maximum interference effect with the least possible burden on the health of the protected persons. Operation of this jammer is limited to one single switch. All required frequency range settings are carried out fully automatically. The built-in chick-charger is highly efficient and the integrated deep-discharging protection gives an early warning of empty batteries. For use in vehicles, external magnetic base antennas are included in the scope of supply. 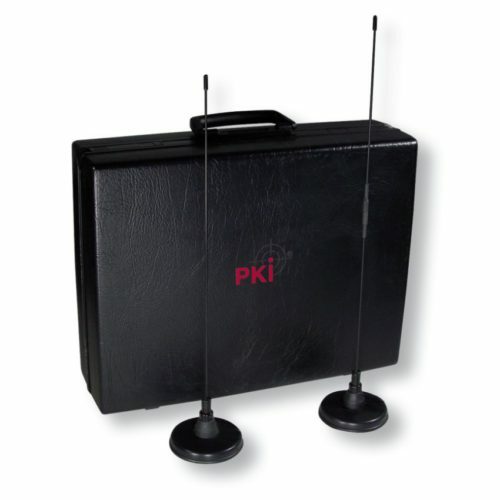 A set of two briefcases yields a coverage of the complete range up to 500 MHz in which most of the remote control systems work. The statistics of the last years have time and again revealed that the remote control of bombs was usually based on existing remote control systems, as e.g. available in common walkie-talkies or remote controlled toys.